Combi Boiler Market size for 2017 was valued over USD 2 billion and is set to exceed an annual installation of 3 million units by 2024. Stringent government norms pertaining to greenhouse gas emissions primarily across residential establishments will drive the global market size. These systems offer improved efficiency and reduced operating cost when compared to separate water and space heating systems. Respective governments in collaboration with the EU have introduced numerous efficiency norms to limit the GHG emissions. For instance, the Energy Related Products Directive (ErP), introduced in 2009 by the EU aims at minimizing CO2 emissions and primary energy consumption while promoting the installation of efficient space and water heating technologies. Growing urbanization along with demand for effective heating systems will stimulate the global market. Rising urban population driven by internal and external migrations has resulted in increased investment towards expansion of residential establishments which in turn positively influence the business growth. As per the UN Department of Economic and Social Affairs, South Korea urban population is set to exceed 19 million by 2050 accounting for over 70% for the total population. Minimal environmental impact along with high system efficiency will augment the condensing combi boiler market. These products tap the heat from outgoing flue gases by using heat exchangers. The tapped heat is supplied to the incoming cold water from central heating system which results in improved efficiency. Measures to limit the emissions across domestic buildings will further complement the industry growth. Non-condensing combi boiler market is anticipated to grow over 3% by 2024. Ability to withstand wide temperature fluctuations and low cost are some of the key factors which will boost the product demand. These systems enjoy a considerable penetration outside EU owing to lack of clear policy initiatives toward installation of efficient systems. Minimal maintenance cost along with ease of installation will further enhance the business landscape. Gas fired combi boiler market revenue is set to witness growth on account of low cost, competitive fuel price, ease of storage and a robust gas supply network across developed economies. Ongoing shift toward adoption of sustainable technologies coupled with harmonization of product prices across the globe are some the underlying factors which have resulted in escalated product demand in recent years. Cost effectiveness along with ease of oil availability will drive the oil fired combi boiler market. Limited availability of gas in developing regions make adoption of these products preferable over available alternatives. These products offer improved efficiency and minimal CO2 emissions when compared to traditional heating systems. Europe market is projected to witness growth over 4% by 2024. Government measures to limit carbon footprint across residential sector along with shifting trends toward nuclear families will boost the product demand. The Energy Performance of Building Directive (EPBD), Energy Efficiency Directive (EED), Ecodesign and Energy labelling framework & Renewable Energy Directive (RED), are some the key policy initiatives undertaken by the EU to limit the carbon emissions across residential establishments. U.S. market is set to witness strong growth on account of growing consumer awareness towards adoption of energy efficient heating systems. Rising investments toward replacement of furnace-based heating systems will further enhance the business landscape. The industry across the region is characterized by growing demand for integrated space and water heating systems as these products offer considerable cost saving over the product lifecycle. Limited availability of space across new residential establishments has further instigated the product adoption. Japan combi boiler market in 2017, was valued over USD 150 million. Steady economic growth along with retrofitting of existing residential infrastructure will foster the business growth. As per the World bank in 2015, Japan is one of the most urbanized countries in Asia-Pacific region with over 94% of population living across cities. Harsh winter conditions in the country will further enhance the business landscape. Prominent combi boiler market participants include BDR Thermea Group, Daikin, Hoval, HTP, Viessmann, Fondital, Wolf, Ferroli, Vaillant Group, A. O. Smith Corporation, ACV, KyungDong Navien, SIME, Ariston Thermo Group, Groupe Atlanti and Bosch Thermotechnology. 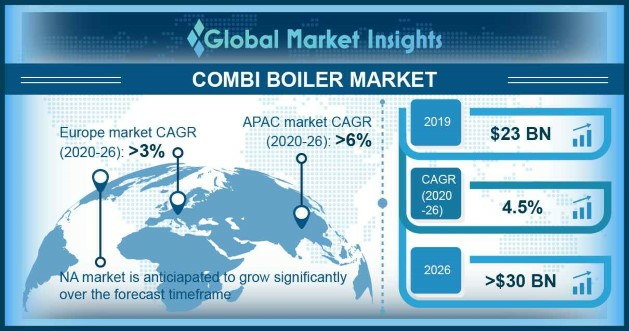 Key industry players are undertaking mergers & acquisition, product innovation and manufacturing capacity enhancements as part of strategy to secure a competitive position in the combi boiler market. Combi boilers are closed vessel which provide central heating along with hot water for the residential establishments. These products offer compact size, high efficiency and ease of installation when compared to traditional heating systems. Industry over the years has witnessed growing penetration of these systems on account of stringent product efficiency measures coupled with rising popularity of single family households.